It is our pleasure to announce the appointment of Kishore M. Naidu. as Chief Revenue Officer (CRO). 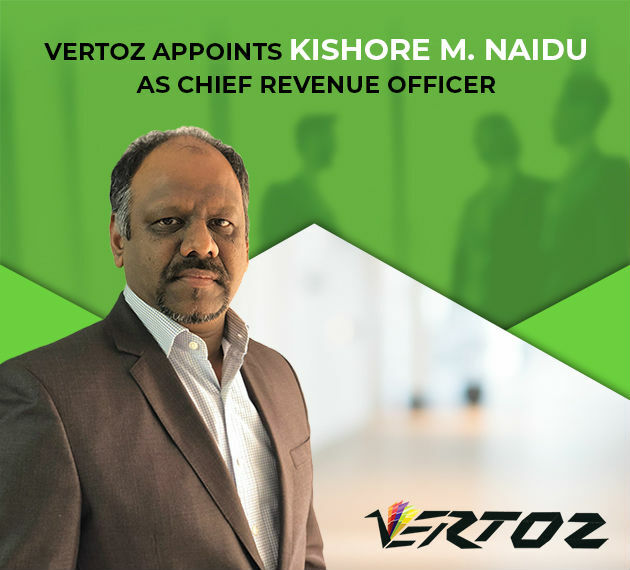 Based from Vertoz’s Mumbai headquaters, he will be responsible for spearheading the company’s strategy and business growth. Apart from the revenue growth of the business, he will also be responsible for identifying new revenue streamlines, aligning technology & ad tech operations, and business development. Kishore brings with him over two decades of leadership experience in sectors such as growth strategy, business management, and sales & marketing. He has a stellar record in sectors ranging from consumer goods and services, telecom, advertising and infrastructure with big-name brands like Lowe Lintas, Bharati Airtel, Leo Burnett, Maytas (Satyam Group), Raheja Universal, Omniscience Capital and Illuminatix Consulting. Kishore is an alumnus of the INSEAD Business School in France and has completed his MBA from the Abertay University, UK. His keen eye for business insights and strategic growth has made him instrumental in driving profits and building durable competitive advantages throughout his professional journey.